Cauliflower Potato and Leek Soup- so creamy and flavorful that you’ll never believe it’s vegan and gluten-free! Yesterday was my grandmother’s 80th birthday. You would never be able to tell that just by looking at her though. She’s as fiery and beautiful as she was twenty years ago. The 2700 miles between us have made it difficult to spend a lot time together over the last couple of years but we’re pretty good at keeping in touch through email. 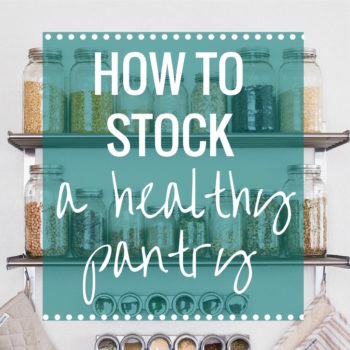 She regularly sends me different recipes from the newspaper or random sources that she finds to help keep my creative juices flowing for the blog. Recently she sent me one for cauliflower soup that had fennel, celery root, chicken broth, heavy cream and a list of other ingredients that I don’t normally cook with, but it inspired to me make my own version using fresh leeks and potatoes for a heartier flavor. 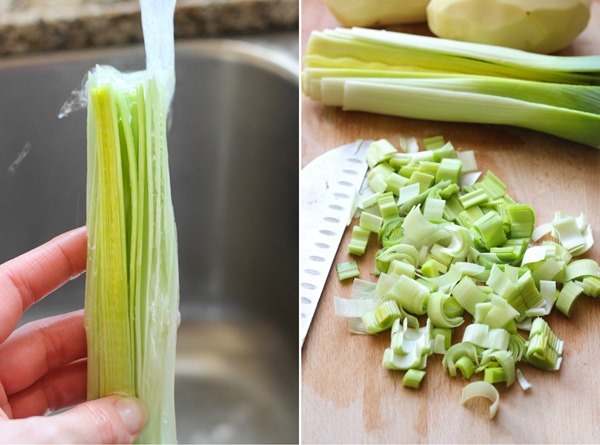 If you’re not familiar with leeks, I highly recommend giving them a try. My father-in-law, aka the produce connoisseur, describes them as a milder version of a scallion and I would agree with that. They give this soup a delicious flavor plus they’re high in vitamin C, folate, and potassium. Perfect for warding off those winter germs! They can be a little dirty to work with but if you slice them in half and run them under water then it usually does the trick. The beauty of this soup is the pureed cauliflower which gives it a rich and creamy texture without the use of any dairy. The result is incredibly smooth and comforting. I topped it with pumpernickel croutons and cheese to add some color but that’s not necessary if you don’t have them on hand. 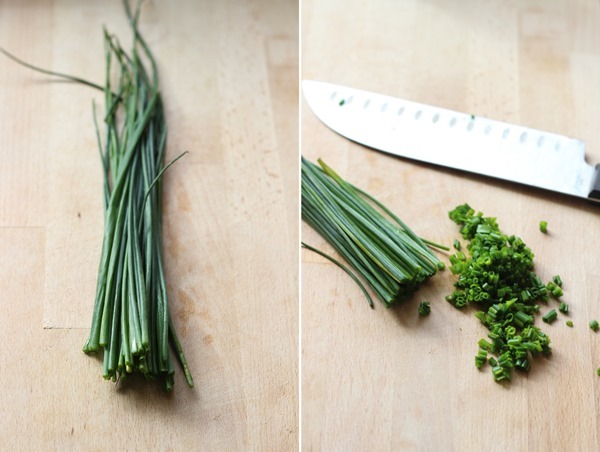 However you should really try it with fresh chives. It gives it that extra little pop of flavor that takes it over the top! In a large pot over medium heat, warm one tablespoon olive oil. Add the leeks and garlic then cook for 2-3 minutes. Next add the potatoes and the cauliflower then sprinkle with salt & pepper and stir together. Cook for another 5 minutes. Pour in the vegetable broth, bring to a boil, then reduce to a simmer and cook for about 20 minutes, until vegetables are tender. Using a blender (or an immersion blender) puree the vegetables until smooth. Pour in the milk and stir together until thoroughly heated. If you prefer the soup to have a thinner texture, simply add more milk and puree until desired consistency is reached. 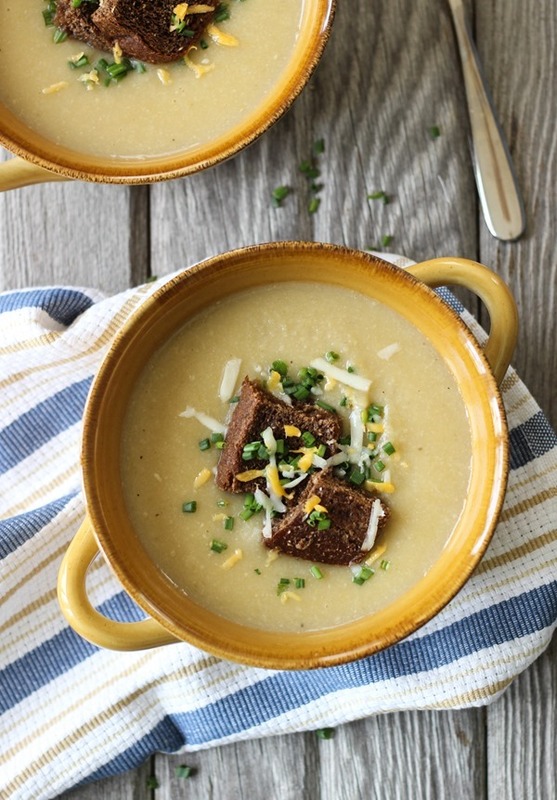 Distribute the soup into separate bowls, top with fresh chives, croutons, and/or cheese. Serve warm and enjoy! To make your own croutons: Preheat the oven to 400°F. Slice your favorite bread into 1-inch squares and spread out on a lined baking sheet. Lightly drizzle with olive oil and a sprinkle of salt then bake for about 10 minutes, until just crispy. Sounds delicious! Thanks for the feedback, Amy! I’m totally saving this! Just two days ago I was thinking I want to make cauliflower/leek soup. OR potato/leek soup. You’ve just solved my dilemma, so thank you! I also love the pumpernickel croutons cause that’s one of my favorite breads. Awww I love that your grandma sends you recipes… that’s awesome. 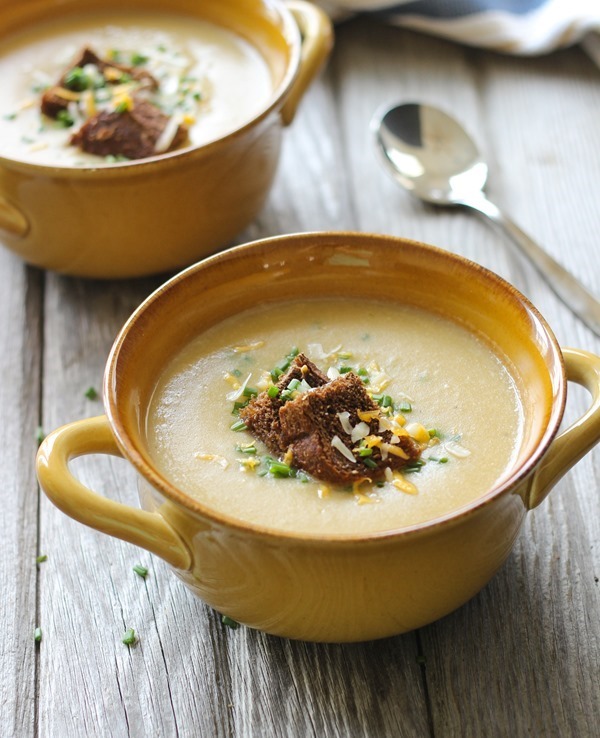 I’m totally on board with croutons on top of soup… oh, and your photos are gorgeous btw!! Your grandma sounds very sweet. It was my Nanny’s birthday two weeks ago, she turned 78, and I was thinking the same thing as you, I don’t know what life would be like without her. Happy Birthday to your grandma. This soup sounds quite tasty! Happy birthday to your grandma!! That’s so sweet she sends you recipe ideas. There’s nothing like keeping the bond alive in spite of long distance. This soup looks sooooo silkyyyy! I love leeks and cauliflower so I’m jazzed to try this! Can we go skiing and put this soup in a thermos to keep us warm on the chair lift? 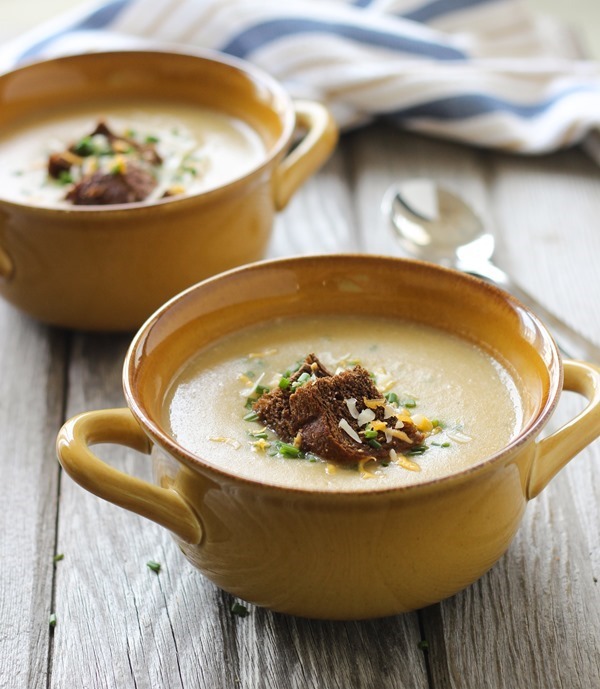 We must be on the same wavelength – I made potato leek soup this weekend too! I used red potatoes and no cauliflower, but I love that idea to make it even creamier. Yummy! This reminds me so much of being a kid! My mom was constantly making potato leek – but adding cauliflower probably makes this outta this world. Love that you used almond milk, too! 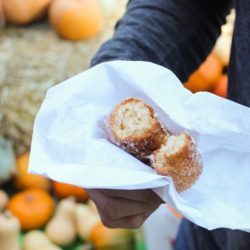 Recipes from Grandma? That’s awesome! I bet it makes the food taste that much better knowing the love behind it. :) And which traits did she pass on to you? Awwww, happy birthday to your grandma!! Love that she sends you recipes and things. My grandma and I had a special bond with food too. Her and my mom taught me to cook with love! Happy belated birthday to your grandmother! 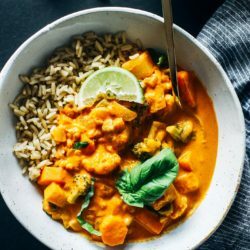 This soup looks amazing and I love that it’s vegan and gluten-free! I am saving this recipe! I love soup in the cold weather. Perfect comfort food! Happy birthday to your grandma!! And I love the looks of this soup you created based off the recipe she sent you! I don’t use leeks enough … I should really change that. And gorgeous photos – the light is so pretty! 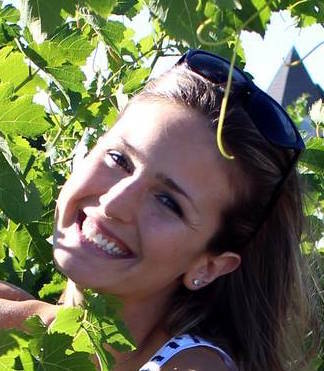 I just found your blog via Food Gawker and I am loving it! This soup looks so soooo yummy! This sounds amazing! 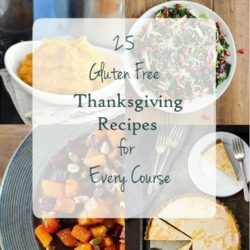 I’ve probably made at least half of the recipes that you feature here ;) If you ever decide to write a cookbook, I will definitely purchase it! Gorgeous photos, too. The relationship between you and your grandmother is so sweet! 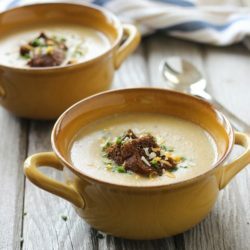 I love potato and leek soup but never have thought to add cauliflower before, this is definitely a delicious, hearty and comforting recipe that I need to try! Grandma’s recipes are always the best. Mine is 90 years old and still makes fresh pasta on Sundays. I look forward to going back home and preparing a hearty soup like this one! Thanks so much for an excellent recipe! 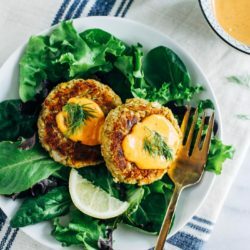 I’ve made this twice now – so easy and tasty! Second time I added some ginger as I had a bit of a cold. Both ways are great. Thanks for the recipe! A friend told me about this simple recipe so I made what I remembered and then looked for a recipe to see if I forgot anything. Mine was even simpler with the dark green leeks leftovers in the frig simmered in stock with the cauliflower and diced potato. When they were all soft I just mashed with a potato masher since I like chunks. I skipped the milk product and the saute steps as she suggested, but I’m going to do your chive topping and a few pumpkin seeds a for more texture. Thanks! I made this recipe tonight, a cold CT evening. I roasted the cauliflower along with the garlic for the smoky richness and depth of flavor it added. mmm. Also, I decided to use a lot of cauliflower and threw in a nonfat greek yogurt at the last minute. In addition, I served it with some parmesan cheese, which made it delightful. I used chicken broth before blending. I used non-fat half & half, but would try it with milk next time as I’m sure it would be as good, if not better. I am obviously not vegan, but I do like to cook close as possible to vegan, when possible. It was awesome, and my husband loved it as well. I will make it again. Thanks for this recipe. Your blessed to have your grandmother. p.s. I used no potatoes and it was still amazing! Delicious! Just made a big pot. Look forward to lots of leftovers. I just made tnis and it was scrumptious! Instead of croutons I sauteed some shiitake mushrooms in Worcestershire sauce and added some chipotle paste (I like my heat, what to do?) and added some on top of the soup before I served it (not too many, though, cause I didn’t wantbthe mushrooms to cover the taste of the soup). Thanks for this recipe. It’s a keeper! That sounds amazing! Thanks for the review, Mary! Great recipe! This was delicious!! The whole family loved it including my 13 year old. Thank you! I am making as we speak..smells delicious. Very good recipe, thank you. Excellent soup. All the family loved it. Very creamy without any dairy. I’m cooking it again today, perfect for cool weather warmth. Thanks Peter! Glad it was a hit! Easy. Delicious. I used chicken stock as I didn’t have vegetable stock. Yum! 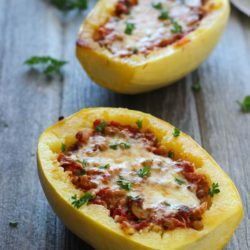 I just made this delicious recipe – thank you! I did feel it was a little shy of flavor so I did add thyme sprigs and a bay leaf to the pot, then a handful of minced lovage to the finished puree. Deluxe flavor! Great recipe. I added a little freshly grated nutmeg at the end. It sent it over the top. Thanks! What a delicious soup! My dinner guests (s0me of whom are vegan and others who don’t like cauliflower) really enjoyed it and even requested the recipe. Thank you for sharing! I served it with Honey-Lemon Chicken, Brown/Wild Rice, and a Brussels Sprouts Salad for a great meal.